HumaKelp is a formulation humic acids and Kelp derived from bull kelp (Durvillaea potatorum). The formulation ensures maximum benefit of highly active humic acids and of the natural plant growth stimulants such as auxins and cytokinins. 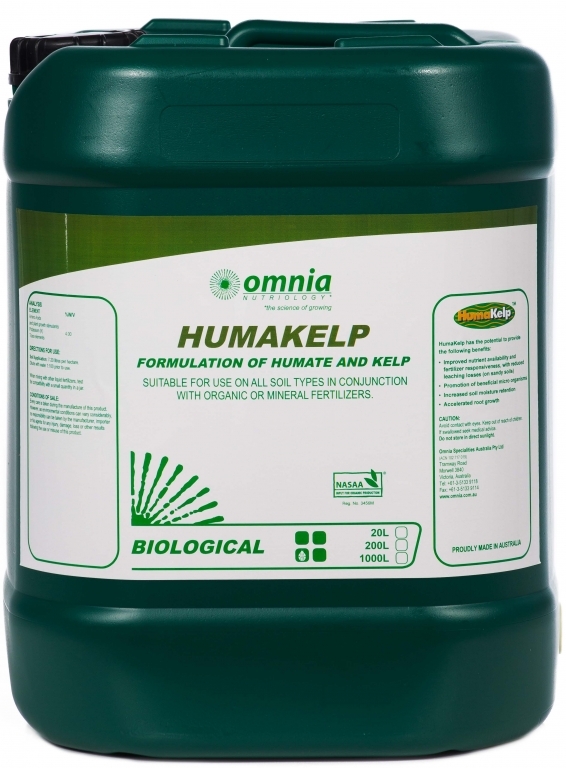 Soil application of HumaKelp maximises the benefits of humate (increased fertilizer responsiveness and soil moisture retention), with stimulation of prolific feeder-root formation through the action of auxins and amino acids in the Kelp extract. Dilute with water 1:100 prior to use. Humakelp is a NASAA-Certified organic product of choice. Humates are a rich source of nutrients and a powerful soil conditioner. Formed over millions of years in the south eastern Victoria region of Australia their unique properties have made them a must-have for Farmers around the world.